Writer Dale Cozort enjoys alternate world fiction and several of his full length sci-fi novels have dealt with this theme. Whereas most such books require much elaborate world building and can be complicated to establish. Now he seems to have found the perfect solution to all that in his Snapshot novellas. We don’t claim to understand the set up fully, but it appears that in the far future bubbles of alternate worlds have been created in which people can travel freely and intermingle with both animals and cultures from various eras in human history. Now one of those major bubbles is Madagascar where various hybrid lemurs and other bizarre creatures live in the wilderness. The land has also been colonized in specific areas to even include an Amish community. It is in this fantastical setting that we meet our protagonists, Scott Hardy and Athena Anders. Both work for a traveling zoo which keeps many exotic animals from lots of different Snapshot worlds. The most popular of these are two dog-sized dinosaurs named Mister McGuffin and Horny Chick. 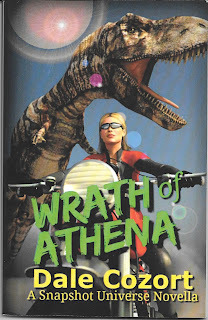 Days prior to the zoo’s opening show, the two dinos escape and it is up to Scott and Athena to find them fast. Apparently Horny Chick is in heat and should she and Mister McGuffin begin breeding, their eggs could hatch and systematically destroy the fragile Madagascan ecology. And if that wasn’t serious enough, they soon realize the animals’ escape might have been caused by someone for nefarious reasons beyond their comprehension. And so the couple races against time to both find the missing creatures and solve the riddle of their disappearance. Cozort has a whopping fun time with this tale and his characters are charming. Enough so that the reader immediately take to them and their odd dilemma. The Snapshot world is a crazy hodgepodge of Sci-Fi stables skillfully employed as an exotic backdrop to a really enjoyable and fast paced novella. If you like the exotic, you’ll find get your fill with this marvelous little book. Enjoy. 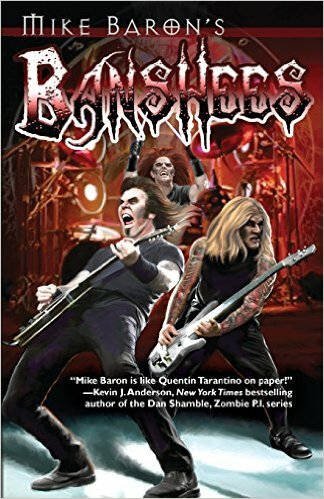 Since turning his considerable talents to prose, Eisner Award winning comicbook writer Mike Baron has been knocking out some fantastic over-the-top fiction. Among these is “Banshees,” a horror fantasy set squarely in the world of rock and roll and its tale is as loud and boisterous as the craziest heavy metal performers blasting out musical Armageddon. The tale revolves around the apparent resurrection of a 70s trio known as the Banshees who went out in a blaze of glory when their private plane crashed into the unyielding Scottish Highlands. Now, decades later a new group appears on the European circuit claiming to be the Banshees and playing the old band’s repertoire in perfect mimicry. Enough so that several people begin to wonder if this may in fact be the actual Banshees returned from the dead. Chief of amongst these is Ian St. James, the only progeny of the original three, being the son of the Banshees’ drummer Oaian St.James. Himself a one time musician, now down on his luck, St. James attempts to contact the group only to be thwarted by the group’s manager, a decidedly thuggish Russian mobster associated with an occult group known as the Mad Monks. When an attempt is made on his life, St. James quickly realizes there is more going on than merely a publicity gimmick by a group of rock and roll posers. Something totally beyond his ability to deal with alone. His luck changes when a reporter for the popular In Crowd magazine, Connie Cosgrove, enlist his aid chronicling the Banshees newly scheduled tour from Berlin to Paris, London and ultimately the US; all to culminated at a sold out venue in Los Angeles. Along the way they meet a weird fellow named Prof. Klapp who is convinced the Banshees are the resurrected dead and their appearance in the world signals the end of times. Whereas only St. James has the ability, through his blood connection, to stop them and save all mankind. Baron’s book is a rocket blast of suspense that moves at breakneck speed. Along the way it is crammed with hundreds of hilarious cultural bon mots and innuendos that set it leagues above other mundane horror tales. “Banshees” is a brilliant achievement by a creative force that is just getting warmed up. The old adage about not judging a book by its cover has never been more valid than with this particular paperback novel. But we’ll get to that aspect at the end of our review. We’d much rather focus on the vital stuff, the story itself. 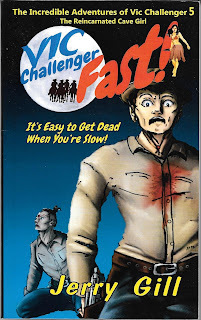 With Victoria Challenger, Jerry Gill has created one of the most original, fun, pulp heroines ever. The back story explains how Vic, as she is known by her legion of fans, is the reincarnation of a primitive cave girl who lived at the dawn of time. Somehow Vic’s memories of her past life survive in her DNA and among these is the fact that in that first life she was mated to a might hunter name Nu, her eternal love. Now reborn in the early 20th Century, she senses that Nu has also returned. This, in her job as a travel writer, she begins to search him out wherever her assignments take her. In this, the fifth book in the saga, Vic, and her best friend, Lin, visit Australia. One of Vic’s aunts, Ethyl Hudgeons, and her husband Pete, live there on an Outback ranch. Eager to explore this new, rugged continent, both young woman arrive at a western seaport and are taken to the wilderness home by an aborigine named Woorak, who works for the Hudgeons. Along their buckboard journey, the friendly native points out all manner of wildlife and flora to the lovely visitors; information that ultimately proves to be life saving. Several days after their arrival, during a dance put on for their benefit, the station is raided by outlaws known as bushrangers in the Outback. Among the loot they purloin from Mrs. Hudgeon’s guests is a map detailing the whereabouts of a long lost family treasure. Through various circumstances, Vic and Lin learn that the posse being led by her Uncle Pete has been sent on a false trail and the gutsy Americans decide to go after the brigands on their own. What follows is a harrowing chase across some of the most savage terrain on the planet. The real fun of Gill’s writing is the overabundance of research he has packed into this really fast paced adventure. Enough so that the reader, while enjoying the action, is also given a glimpse into both the natural dangers and beauties of Australia’s Outback. It’s as if Vic’s own travelogue articles had merged with her personal derring-do exploits. This is a rousing tale expertly written with memorable characters, both good and bad. On his website, listed above, Gill tags Vic as the Queen of the Pulps, and after having enjoyed this outing, we’re not about to argue the point. She is clearly one of the most original such ever put to paper and worthy of your attention. And that’s the end of the review. 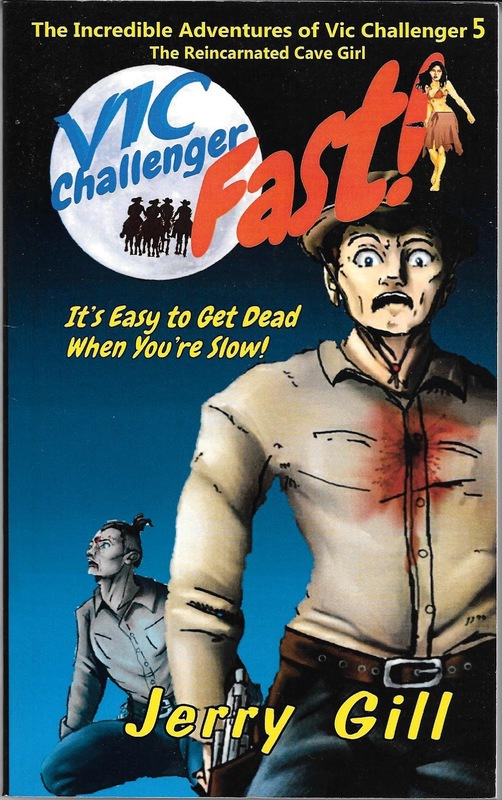 Whereas Gill’s obvious one-man operation, is prey to the typical amateur pitfalls of photo-shop like cover images that are really bad. Enough so that they do the fiction a major disservice, in this reviewer’s opinion. We would admonish our readers not to be put off by them. At the same time, we also plead with the author do some web-surfing and find a professional artist who can dress things up professionally. Vic Challenger deserves nothing less.